The eye fixates an object. When the light reflected from that object enters the eye, it first passes through the cornea. 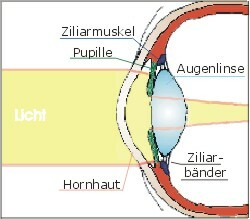 The surfaces of the cornea concentrate the light (75 per cent of total light concentration), and the pupil controls the amount of incoming light. The eye’s lens now concentrates the remaining light, so that the image of the object viewed is reproduced in clear form on the retina. Receptors convert the light picked up by the retina into electric impulses which are transmitted by optic nerve fibres to the respective side of the brain. The image produced on the retina is mirror-inverted and only perceived the right way round after processing by the brain to rotate the image. Each of both fields of vision creates a visual impression which is transmitted to the respective side of the brain. Good stereoscopic vision requires that both eyes work well together, i.e. that they have a similar level of visual function and are capable of precise alignment. It is important, therefore, that the ocular muscles of both eyes interact perfectly. The eye can not only reproduce distant objects on the retina clearly, it can also change the shape of the lens to identify near images in detail. It does so by tensing (contracting) the ring-shaped ciliary muscle that surrounds the eye’s lens. When the eye focuses on something distant, that muscle remains relaxed, causing the ciliary ligaments to flatten the lens. When the muscles contract, however, this causes the elastic lens to curve, so that the light reflected from a near object is more strongly concentrated, producing a sharper image on the retina. As we grow older, the lens becomes less elastic and it loses the ability to change shape and thus create sharp images on the retina, no matter how much tension is exerted by the ciliary muscle. This generally occurs some time in our forties, though the actual age at which the eye’s lens is no longer able to sufficiently change shape varies. Once the process sets in, it is time to have reading glasses prescribed. Accommodation is not the only requirement for good near vision, however, since both eyes need to be aligned in their fixation on an object. This is the job of the ocular muscles. They make sure that the lines of focus of both eyes are such as to meet at the object of vision (point of convergence). The light rays bundled by the eye are reproduced in clear form on the retina (either through healthy vision or corrective aid). The receptors on the retina convert the light to electric impulses. The cone receptors convert light for daytime and colour vision, while the rod receptors facilitate low-light vision. Cones are not particularly light-sensitive, making them unable to process scant light. Instead, this is the job of the rods. However, the fact that the rods are located on a different level of the retina than the cones, means it may be necessary to wear lenses of different strength during daylight and at night. A lot of people are more nearsighted in low light than they are in daylight. It is important, therefore, to test your eyeglass lenses in both light settings. The requirement for different lens strength often becomes apparent when you perceive blurry outer edges around light sources at night time. Good vision is especially critical when you are at the wheel of a motor vehicle. For your own safety and that of others, it is important to have your eyes examined regularly (at two-year intervals). Good stereoscopic vision (i.e. 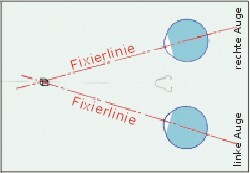 good inter-alignment of both eyes) is an essential factor in a driver’s ability to judge speed and distances. Qualified optometrists can gauge this alignment very precisely and correct it if necessary. Good colour vision is important to help us make quick and easy distinctions between signal colours. Many of the currently fashionable colours used in eyeglasses (yellow, orange, pink, blue) are not suitable for motoring, and there are laws against wearing them while operating a motor vehicle. For night-time driving, the colour in eyeglasses is not allowed to exceed 25 per cent. Legislation was introduced in Germany in 2000 which requires drivers to keep a second pair of glasses of the currently required strength in the car at all times. It is also advisable to have prescription sunglasses at hand to shut out any glare.